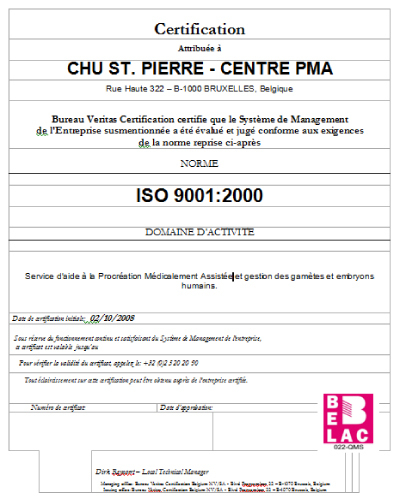 A forerunner in the French-speaking region, the Assisted Reproduction centre at Saint-Pierre University Hospital was awarded ISO 9001:2000 certification on 2 October 2008. It took the AR team two years of team work to elaborate a quality management system based on the globally recognised ISO 9001 standard. This system has allowed us to improve the “traceability” of our work and patient care. Here you will find our centre’s “Quality Manual”. In this document you will find a summary of all the actions undertaken with a view to obtaining our certificate.